” The NSW Government committed to reset its relationship with Aboriginal communities following the release of its Aboriginal affairs plan OCHRE: Opportunity, Choice, Healing, Responsibility, Empowerment in 2013. This commitment came in response to overwhelming community sentiment that services to First Peoples must be provided “with” First Peoples, not “to” or “at” them. This is as true for health services, as it is other services. First Peoples have long called for co-design of services and programs delivered or funded by Government. Preventative and early intervention measures that are co-designed and delivered by Aboriginal communities are essential to achieving better health outcomes. As Head of NSW Aboriginal Affairs, he is responsible to the Secretary of the NSW Department of Education, and was recognised in the recent Queen’s Birthday Honours for outstanding public service to Indigenous people in NSW. He talked to Croakey ahead of the Summit. You can follow him on Twitter at @JasonArdler. “With the theme ‘Aboriginal Health – It’s Time to Reset’, we acknowledge that we need new ways of working to achieve meaningful change in the health and wellbeing of Aboriginal and Torres Strait Islander people. Aboriginal and Torres Strait Islander people must be leading conversations about health and wellbeing and this requires government agencies to make space for this to happen”. Welcome message from Elizabeth Koff, Secretary of NSW Health, who acknowledges the need to privilege Aboriginal voices. The need for new ways of working and for government agencies to make space so Aboriginal and Torres Strait Islander people can lead the conversations on health and wellbeing is the focus of a major national Indigenous Health Summit to be held this Friday (22 June) in Sydney. The 5th Aboriginal and Torres Strait Islander Health Summit – a biennial event of the National Aboriginal and Torres Strait Islander Health Standing Committee, established by the Australian Health Ministers Advisory Council (AHMAC) – is being co-hosted by the NSW Ministry of Health’s Centre for Aboriginal Health and the Aboriginal Health & Medical Research Council of NSW (AH&MRC). Summer May Finlay, a Yorta Yorta woman, public health researcher and Croakey contributing editor, is covering the #IndigenousHealthSummit for the Croakey Conference News Service and sets the scene for the day’s agenda in the article below. See also below a quick Q&A with Jason Ardler, Head of NSW Aboriginal Affairs, on what he hopes will emerge from the Summit – including the strong message that he says came from NSW Aboriginal communities to the state’s health system to “prioritise healing”, in order to keep people out of the service system in the first place. Finlay will live tweet from each of the sessions on Friday, conduct live interviews on Periscope (via Twitter) at @ontopicaus, and later file a big wrap of the discussions. 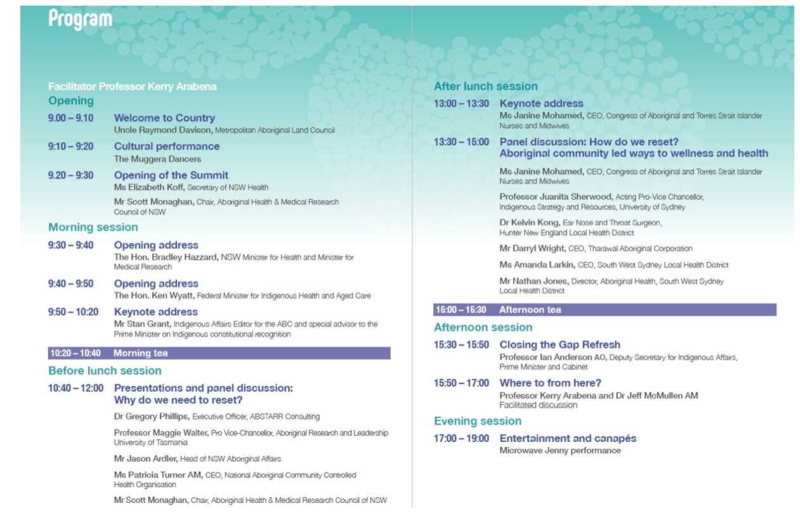 Among those speaking and presenting at the Summit are Federal Indigenous Health and Aged Care Minister Ken Wyatt, NSW Health Minister Brad Hazzard, journalist Stan Grant, researcher Dr Gregory Phillips, Congress of Aboriginal and Torres Strait Islander Nurses and Midwives (CATSINaM) CEO Janine Mohamed, and University of Tasmania Pro-Vice Chancellor (Aboriginal Research and Leadership) Professor Maggie Walter and University of Sydney Acting Pro-Vice Chancellor Professor Juanita Sherwood. Click here for the full program or see all the speakers and panelists at the bottom of this post. Aboriginal and Torres Strait Islander people have poorer health and wellbeing than other Australians. This is well known. The ongoing gap is despite increased investment in Aboriginal and Torres Strait Islander health, under the Closing the Gap Framework, which was introduced by the Coalition of Australian Governments in 2009. So what is happening? What needs to be done? Why are the current solutions not working? And what policies need to be in place to see real and meaningful change? Ultimately the lack of substantive change means it’s time to “reset” the Aboriginal and Torres Strait Islander health approach. This cannot and should not be done without Aboriginal and Torres Strait Islander people. 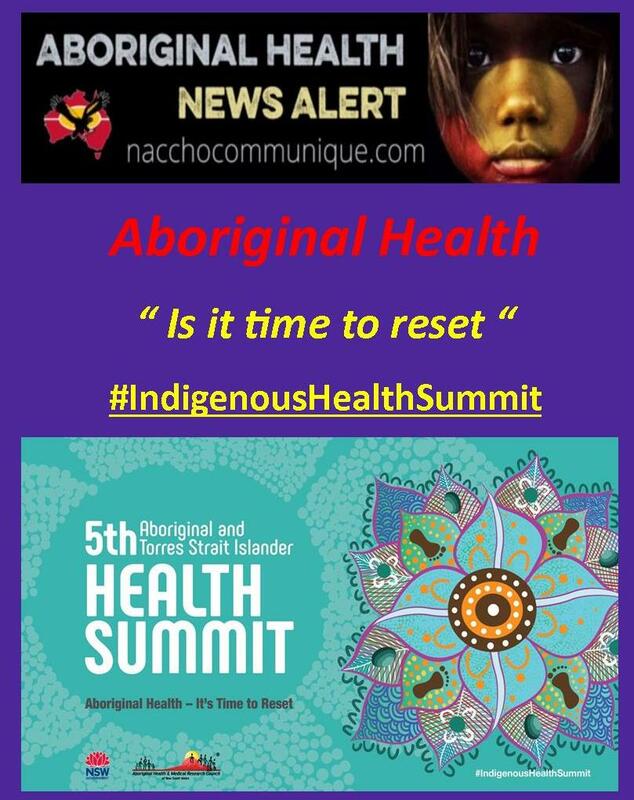 “Aboriginal health – it’s time to reset” is the theme for the 5th National Health Summit being held in Sydney on Friday 22 June. The summit is hosted by the New South Wales Ministry of Health and the Aboriginal Health & Medical Research Council of NSW. With a program that features almost entirely Aboriginal and Torres Strait Islander people, the Summit will be a meeting of the top policymakers in the country, both Aboriginal and Torres Strait Islander and non-Indigenous, and from the government and the non-government sectors. They are the people who can drive a reset agenda. One summit will not and cannot address the health outcomes and change policy overnight. What it can do is assist in shifting the approach. Shift the underlying ideology away from being government-led to community-led. And a shift is what is required. There is no hiding that Aboriginal and Torres Strait Islander people, the country’s first peoples, the traditional owners of this land, have always fared worse than those who have subsequently migrated here. To call for a reset is brave. The agenda is bold, courageous even. The first panel discussion, with only Aboriginal presenters, will outline why a reset is required. An all-Aboriginal panel is making a statement: that Aboriginal and Torres Strait Islander people need to be leading the way if we are to indeed reset. The second panel, which is mostly Aboriginal, asks “How do we reset?” with a focus on Aboriginal community-led ways to wellness and health. Since the National Aboriginal Health Strategy, the first national attempt to address Aboriginal and Torres Strait Islander health, there has been a call from Aboriginal and Torres Strait Islander communities for community-led solutions. The concept of community-led solutions is not new; however, rarely have we seen policy that genuinely embraces this approach, which is why it is essential it is on the agenda for the National Summit. The afternoon session includes a short update on the Closing the Gap Refresh by Professor Ian Anderson, the Deputy Secretary for Indigenous Affairs, Prime Minister and Cabinet. With much of the consultation already completed, it will be interesting to see how the Refresh will align with the approaches suggested during the National Summit. The meat of the day, however, and probably the most challenging session will be the last: “Where to from here?” This will be led by Professor Kerry Arabena, Chair for Indigenous Health and Director of the Indigenous Health Equity Unit at the University of Melbourne, and journalist, author and filmmaker Dr Jeff McMullen. Change is challenging. It means that each individual needs to look at their own ways of working and consider how they are contributing to the status quo, i.e. the Aboriginal and Torres Strait Islander health disparity. It is in the uncomfortable that I believe we will see real change. The uncomfortable is where we start to question and review our own underlying beliefs and attitudes. It is through this process that we can shift our own ways of doing business to assist in creating a better future for Aboriginal and Torres Strait Islander people. Some of the attendees, an invitation-only group from across government, health and social sector organisations, and research institutions, may be stretched beyond their comfort zones; however, there is no doubt that all levels of governments and non-government sectors want to work towards better outcomes for Aboriginal and Torres Strait Islander people. Those who are there on Friday hopefully will walk away feeling reset themselves and with a renewed vigour for the work ahead. Resetting the Aboriginal and Torres Strait Islander health agenda: it’s not an easy task but a necessary one for Aboriginal and Torres Strait Islander people and all Australians. Q: Why is the theme important to you? A: The NSW Government committed to reset its relationship with Aboriginal communities following the release of its Aboriginal affairs plan OCHRE: Opportunity, Choice, Healing, Responsibility, Empowerment in 2013. The Aboriginal community-controlled health sector in Australia is leading the way in this regard, and must meet the challenge of sustaining these approaches. Q: What is the one point you hope to get across at the Summit? A: When the NSW Government asked Aboriginal communities in 2011 what a new Aboriginal affairs plan should include, Aboriginal people across the state warned us that if we continued to focus on providing services to fix people up, we would continue to achieve the same poor outcomes. Instead, we were told to prioritise keeping people out of the service system in the first place – and that means prioritising healing. Healing is a process that is necessarily different for every individual, family and community – which is why “co-design” with the First Peoples is critical. Q: What do you recommend people read or watch in the lead up to the event?